The national Let’s Move! 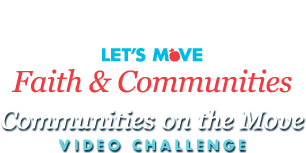 Conference Call for faith and community leaders about the Communities on the Move Video Challenge is taking place tomorrow, March 14 at 2:00 PM Eastern, 1:00 PM Central, 12:00 PM Mountain, 11:00 AM Pacific. Join Sam Kass, White House Senior Policy Advisor for Healthy Food Initiatives, on the call to learn more about the competition and the opportunity for winners to meet First Lady Michelle Obama.